Nyhedsklip og Artikler: Dødehavet er i færd med at dø. Dagbladet har idag en artikkel om Dødehavet,som de hevder er iferd med å dø. Vannet synker så mye som en meter hvert år, og langs bredden sluker hundrevis av synkehull store landeområder. Dagbladet skriver,at den historiske og unike innsjøen nå er i ferd med å forsvinne. Videre skriver Dagbladet en del om de rent tekniske årsakene til at dette skjer. Her på Spikers Corner har vi lyst til å benytte anledningen til å dra frem noe av den Bbelske historien rundt Dødehavet. Derfor poster jeg en liten artikkel som jeg fant om dette. Læs desuden: Dødehavet - en uhyre interessant historie. The Primordial Sea, the Plains Sea, the Salt Sea – these are but a few of the names of the Dead Sea, which features in narratives throughout religious history. Below is an overview of the sources where the Dead Sea and the Jordan Valley are mentioned and the historical events that took place there. The Dead Sea has served as the backdrop to some unforgettable events on the world’s stage of history: the patriarch Abraham fought a war there, David hid there from King Saul, the prophet Ezekiel had visions there, the story of Masada happened nearby, and Jesus was baptized there by John the Baptist. The book of Genesis refers to a war conducted by four kings against five at the Dead Sea: “All these were joined together in the vale of Siddim, which is the salt sea” (Genesis 14:3; all Biblical citations on this page refer to the King James Version). In the course of this war, Lot, Abraham’s nephew, was taken captive. Abraham, whose name was still Abram at this point, went out to pursue the captors and bring Lot home. The phrases “Valley of Siddim” or “Siddim Sea” come from the root s.i.d., which means clay, tar or pitch, materials that are typical of the Dead Valley region. The book of Genesis also notes that two of the kings fell into the pits typical of the area during the war: “And the vale of Siddim was full of slime pits [tar pits]; and the kings of Sodom and Gomorrah fled, and fell there; and they that remained fled to the mountain” (Genesis 14:10). Many years after Abraham fought in the area, David, who would later be king of Israel, fled there from King Saul: “And David went up from thence, and dwelt in strong holds at Ein Gedi” (I Samuel 23:29). This area was also where the cave incident took place: David entered a cave where King Saul was sleeping and cut off the corner of his outer garment, thereby proving that he had no intention of harming his king. Elijah, one of the prominent prophets in Judaism and a religiously significant figure in Islam and Christianity as well, parted from his disciple Elisha and ascended to heaven in a chariot of fire drawn by horses of fire: “And Elijah said unto him, Tarry, I pray thee, here; for the Lord hath sent me to Jordan. And he said, As the Lord liveth, and as thy soul liveth, I will not leave thee. And they two went on (II Kings 2:6). The spot where Elijah ascended to heaven in a whirlwind would later be considered by the Christian tradition to be the spot where John baptized Jesus. Today, the location is known as Kasr Al-Yahud: “These things were done in Bethabara beyond Jordan, where John was baptizing” (The Gospel of John 1:28). In the book of Genesis, the Dead Sea is called the Vale of Siddim: “All these were joined together in the Vale of Siddim, which is the Salt Sea” (Genesis 14:3). In the book of Joshua, the Dead Sea is called the Plains Sea: “That the waters which came down from above stood and rose up upon an heap very far from the city Adam, that is beside Zaretan: and those that came down toward the Sea of the Plain, even the Salt Sea, failed, and were cut off: and the people passed over right against Jericho” (Joshua 3:16). The book of Zechariah refers to the location as the Former Sea (i.e., meaning “early”; the Hebrew root q.d.m. means “early” or “before” and thus also refers, spatially, to the east, where the sun rises. Therefore, the phrase “Former Sea” indicates that the Dead Sea is located in the eastern part of the land of Israel): “And it shall be in that day, that living waters shall go out from Jerusalem; half of them toward the Former Sea, and half of them toward the hinder sea: in summer and in winter shall it be” (Zechariah 14:8). 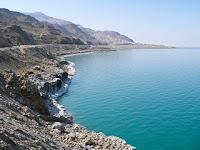 Non-biblical sources refer to the sea as the Dead Sea, because the water cannot sustain marine life, though it is host to several types of algae and bacteria. In the course of human history, many different sects sought refuge at the Dead Sea. These included the Qumran sect, considered to be the descendants of the First Temple priest Tzadok, and the Sicarii, the group of Jewish rebels who committed suicide on Masada, thus giving birth to the Masada myth. In modern times, a Bedouin tribe discovered the Qumran scrolls here in the early 1900s; these shed new light on a hitherto mysterious chapter of ancient history. Read furthermore: Israel’s Dead Sea Is Disappearing At A Shockingly Fast Rate.